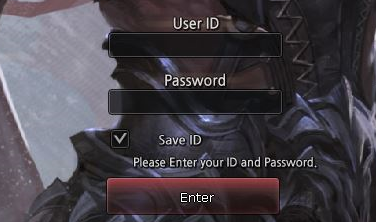 When you first log in to the game your user ID and the password is the same as your Aeria Games account. If you have not registered for a free account, please follow the link here to create one. Appearance This feature will allow you to customize your look and height. This is always changeable later with a appearance change scroll. Basic: this allows easier leveling and gives you the feel of the class you choose, The stat points are less than that of ultimate mode, however this toon will not delete upon death without a resurrection rune. Ultimate: this is a preferred mode of many players, because they are stronger, as they receive more skill and stat points. This toon however will delete upon death without the use of a resurrection rune. All available quests are displayed on the mini-map as yellow exclamation marks. NPCs offering quests at these locations will have a glowing symbol over their head. Double-clicking on these NPCs will bring up the option to "trade" or "talk to" the NPC. Select "talk to" to learn about any available quests. Selecting "talk to" will bring up the NPC quest window. Here you can listen to news and stories of the lands you're adventuring in, and also learn of opportunities to perform tasks for rewards and experience. If you want to take on a particular quest, click on the "Accept" button. If you do not want to accept an available quest, click on the "Cancel" button. After accepting a quest, you can review the description and quest completion requirements by pressing the "U" key; this will bring up the "Quests" interface. Here, all active quests will be listed in green text, and quests that have all requirements fulfilled will be listed in yellow text. Once you have fulfilled all of a quest’s requirements, look for a blue orb on your mini-map. This will usually be the NPC who first gave you the quest; now the NPC awaits your return so he/she may reward you for your effort. Movement within the world of Shaiya is fairly straightforward. To move your character to a location, you have two options. Option 1: Point and Click Navigation. Simply click on the location you wish your character to move to, and they will travel to that desired point. Hold down the right mouse button to look around the world; you can also do this while using the arrow keys on your keyboard. Option 2: Shaiya also supports WASD Keyboard Movement. Pressing "W" will move your character forward; "S" will move them backward; "A" will turn your character to the left; "D" will turn your character to the right; "Q" will make your character strafe left; and "E" will make your character strafe to the right. Double-tapping "W" will make your character run forward until you stop them by pressing another key. Double-tapping "S" will make your character perform a leaping action. Pressing the space bar makes your character jump. If your character ever becomes stuck, or you want to be instantly transported to the nearest city, simply type "/return" in your chat window and press "Enter." When an enemy is on the screen you can attack them by placing your mouse cursor over them. When the cursor turns into a sword you can click on them once to target them. You can now either cast a spell or use a skill to attack your enemy, or simply click on them again to perform your normal attack. Pressing "Enter" at any time will activate the chat window in Shaiya. Here, you can type in any text and have it displayed in game so you can communicate with other players. If you do not wish to broadcast your chat publicly, there are other options for chatting. These can be accessed from the drop down menu to the left of the chat box. Normal: Regular chat that broadcasts to any players within listening distance. Whisper: This is a direct chat to another player. You will have to enter the player’s character name and then the message you would like to send. Party: This message will only be heard by members of your party. Guild: This message will only be heard by members of your guild. Transaction: This is used when you would like to broadcast messages concerning the buying, selling or trading of items.